That’s how area executive chef Michael Kingsley describes his food philosophy at our newly re-opened/revamped (and renamed!) Garden View Café. Let’s start with a few photos of the food—just to focus the brain. Breakfast at the Garden? Try the fresh-made yogurt with granola and fruit. Lunch at the Garden? Try a salad of baby greens with watermelon radish, a hint of bacon, and homemade croutons. Dinner at the Garden? 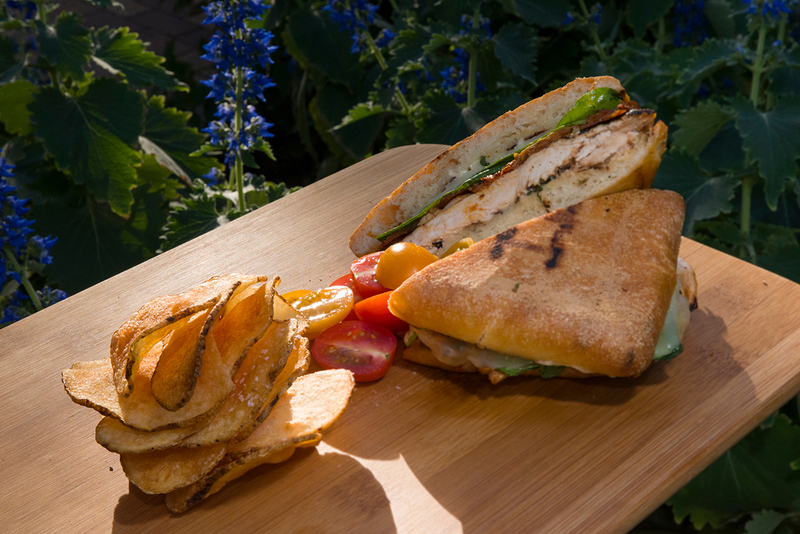 Enjoy outdoor seating under the willows with your fresh-made balsamic chicken panini. Chef Kingsley has the experience to know what those words really entail. He’s done it all in his decade-plus as a chef: cooked in the world of hotels, country clubs, and French restaurants; served VIP dinners to former President Bill Clinton, to Supreme Court Justice Ruth Bader Ginsburg, and to sommelier Alpana Singh of Check, Please! and, as area executive chef for Sodexo, overseen the restaurants at some of Chicago’s most popular public institutions. In a fun and foodie interview, the chef explained what makes the Garden View Café’s approach so interesting. 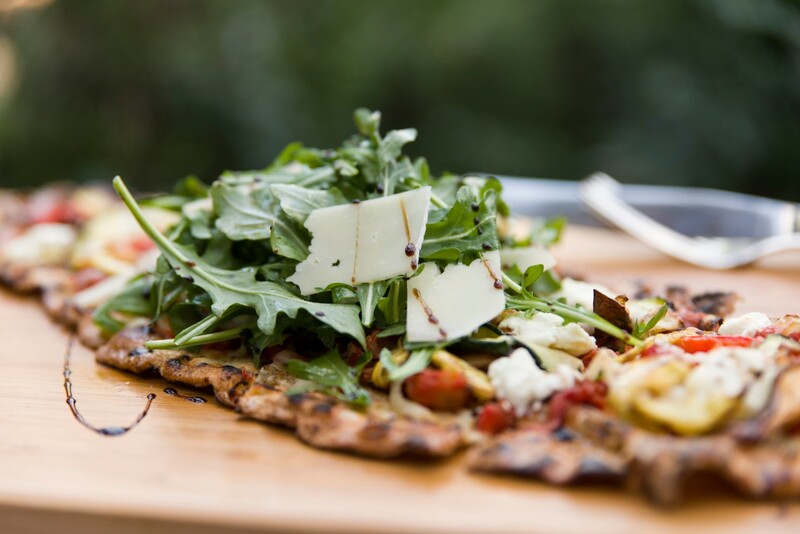 Seasonal veggies never tasted so good: arugula topped with shaved cheese and a drizzle of balsamic vinegar on a fresh-baked flatbread. “We wanted a truly seasonal menu,” Kingsley says, “that changes three times per year, according to what grows in spring, summer, and fall. What we’re serving here is what’s really growing around here.” Of course, it takes a lot of planning to gather all the ingredients for a fresh-based café menu. Know where your food comes from: local suppliers from the quad-state area are proudly pointed out at the Café. Beyond the Garden, Kingsley honed relationships with the local vendors that supply what the Garden can’t: bread from Chicago’s Red Hen Bread, pastured chickens from Indiana’s Gunthorp Farms, handmade cheeses and fresh sausages from Wisconsin’s best artisans, asparagus from Michigan’s Daisy Farms. 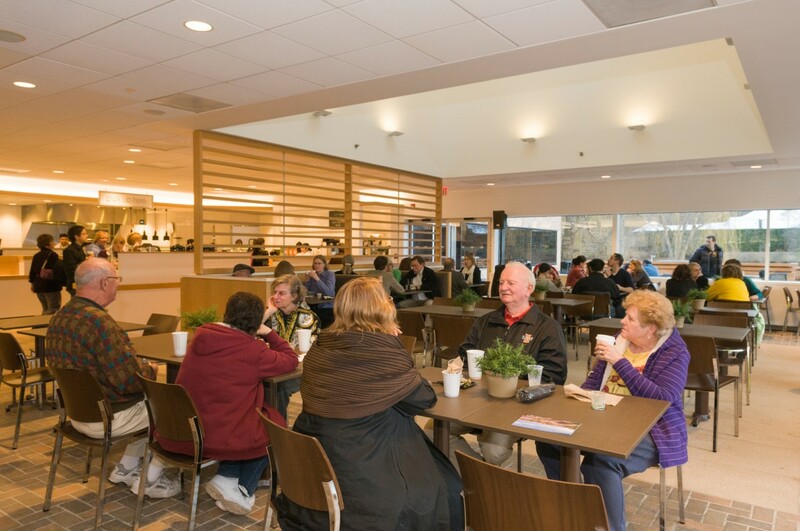 “It’s not just that we use local chickens,” Kingsley explains, “but also that we support our neighbors—and therefore grow an economically healthy community for us all.” It’s a fantastic group of resources, whose names are proudly posted in the Café. Check out the full list of providers here. With his resources in place, the chef turned to the how-to’s of service. How to grab a quick takeout or snack (at easy-to-browse coolers and a farmer’s table at the Café entrance). How to order from the fresh-cooked menu (walk right up to the counter at the open kitchen, where it’s prepared on the spot). How to get hot food to your table quickly (servers deliver and/or pagers buzz when it’s ready). 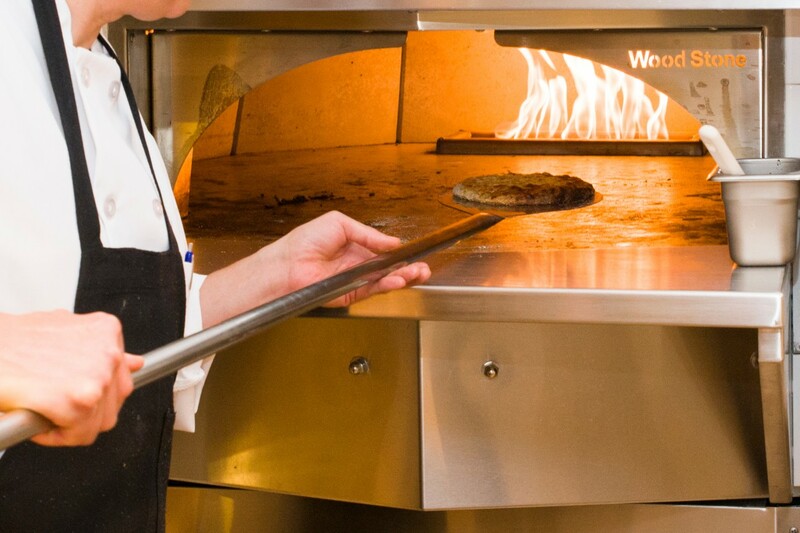 Flatbreads are baked to perfection on demand. A Wood Stone brick-style oven. It’s big. It’s fast. It cooks Kingsley’s flatbreads (thin pizzas + yummy toppings) to crispy perfection. The daily flatbread special is always posted on the chalkboard, and there are four standard versions on the menu, too. Barista service. Double-skinny vanilla latte with a splash of hazelnut? No problem. At the new barista station, we proudly serve Starbucks coffee…and its full menu of hot and cold beverages. The baristas—all of whom have been trained by a Starbucks coffee master—are happy to talk roasts and brews, too. It’s renamed the Garden View Café for a reason. The clean, open, airy interior lets in maximum light—and a photo-worthy view—through the big, Edward Barnes-designed windows. 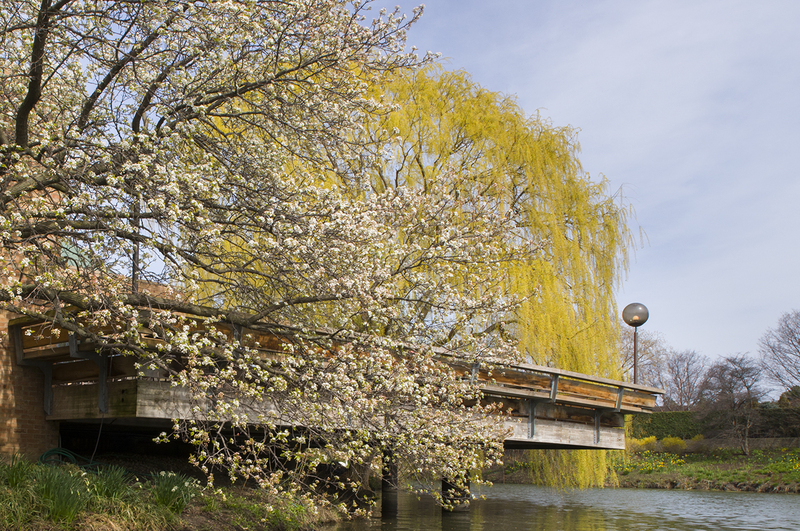 They act like frames around the always-changing view of the lakeside garden: daffodils in spring, flowering natives in summer, hibiscus in fall. Two outside decks (take your tray across the hall to relax with a view of Bird Island) act like the ultimate sidewalk café—except without the traffic, the concrete, or the noise. “Of course we give out Café recipes,” smiles area executive chef Michael Kingsley. “They’re not proprietary, and they’re uncomplicated—you can make meals this way at home, too.” Three seasons’ worth of café recipes are on our website. Kids get the healthy treatment, too (though they won’t realize it). Sure, there are chicken tenders, but they’re baked with a cornflake crust. There’s mac and cheese, with good-for-you butternut squash as a hidden ingredient. And almond butter panini with apples subs for PB&J. 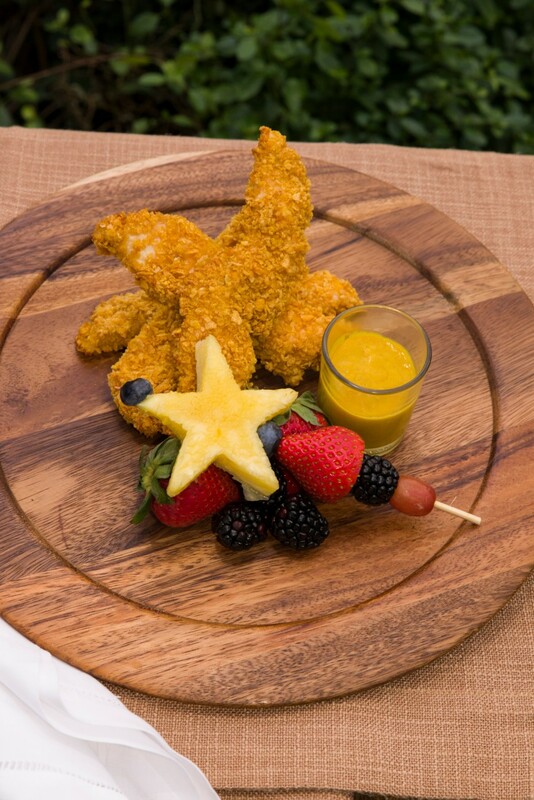 What kid wouldn’t try fruit shaped like a star?